The current agenda features 3 items of particular interest. Two involve planning applications and the third is an officer’s response to a request for data on car parking waivers as a potential tool to use at VCAT. What is presented in each of these reports we find staggering and wonder what on earth is going on with planning in this council. As per usual, the report concludes that – It is considered that the extensive resources required to collate car parking waiver data could be more effectively directed towards creating the strategic basis for future car parking provisions. By doing so, much needed clarity can be provided to the town planning process in Glen Eira with subsequent benefits in defending VCAT appeals. Backing up the ‘do nothing approach’ we get – A comprehensive audit of past planning decisions to obtain car parking waiver data would be a resource intensive exercise. The ultimate recommendation therefore reads – That Council acknowledges this report and the strategic work that is underway which will ultimately lead to clearer and more effective planning provisions around car parking. We also urge readers to note the following paragraph – In terms of specific controls,Council’s adopted Planning Scheme Review Workplan is committed to investigating the use of Car Parking Overlays and Parking Precinct Plans. These controls can provide greater clarity for decision makers, the community, and permit applicants through location specific car parking rates or developer contributions. Resident comments on the planning scheme review were strongly in favour of developer contributions. Here we find ‘or developer contributions’ and this is the only time in the entire report that this issue rates a mention. Question: does council really have any intention of introducing a levy for car parking waivers? Given that the emphases is entirely on overlays and Parking Precinct Plans, which were promised in 2003/4 – our skepticism is probably warranted! More of the same from this council? – ie let’s not do anything for the moment until our structure plans are in place! We do not see how the collation of empirical data should impact the ongoing development of structure planning. We would also assume that such data should be available on council’s computer systems. If it isn’t then why not? – especially when millions upon millions are spent on council’s systems. Surely it is time that some decent programming was undertaken so that all data pertaining to an issue is there at the click of a button? Below are two screen dumps that show the zoning for the applications. One in North Road, Ormond (5 storeys, 4 units) and one in Jasper Road, McKinnon (4 storeys, 4 units). Worth noting that council hasn’t used zoning maps, but instead included aerial shots which (perhaps intentionally) do not show up the planning contexts of these sites. Before proceeding further, readers might like to hazard a guess as to which application was refused and which was granted a permit? It is considered that the proposed development complies with Council’s Housing Diversity Area Policy. The height, density, mass and scale of the development is considered appropriate for this location. The height and scale of the proposal are in keeping with the emerging character of the areaencouraged by State and Local Policy.The proposal has a maximum height of 16.7 metres. This is comparable to the approved development under construction next door at 534-538 North Road which also has a height of 16.7 metres. On overshadowing – Whilst there will be overshadowing created by the proposal it is not considered to have any unreasonable impact on any adjoining land given the mixed use zoning to the east and west and the non-residential use immediately to the rear. Thus on all the major ‘criteria’ this proposal meets the requirements. The refusal boils down to laneway access and car stackers and that the plans have not ‘satisfactorily demonstrated’ that access and layout provide a ‘safe environment for users’. So we now have the situation where an application for 5 storeys in a Mixed Use Zone and surrounded by GRZ, and other commercial sites that are already 5 storeys is refused on grounds that we doubt will stand up at VCAT. Besides, council already thinks that 8 storeys is appropriate for the Ormond Tower! Transport planning is against waiving of the car parking spot for the food outlet but in the end it is considered ‘acceptable’ to waive the requirement because of the ‘availability of public transport’, and ‘onsite car parking’. Isn’t North Road also close to public transport? 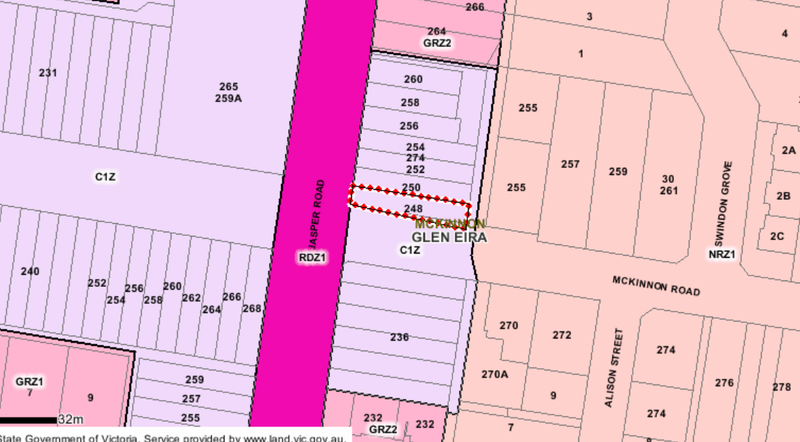 How about providing the full facts – ie width of laneway in North Road application? What does this all this say about council considering ‘cumulative impact’ on street car parking spaces and on the overall approach to providing transparent and credible officer reports? Is it too much to hope for that the “acting manager town planning” job title in the reports means there have been changes at the top? Find out who the developer and his council mates are and that’s your answer. Colin – start checking private Childcare centres in GE followed by developments. Struggling to read the plans properly but IF the Jasper Road one had happened to be in GRZ2 would it even meet the rear setback requirements which were put in place to achieve a visual transition to the NRZ? i.e. 11.5 metres at third storey level. Charging developers anything from $3000 to $20000 per car waiver goes against the grain in Glen Eira. The aim has been let’s make it as easy and cheap as possible for our friends.